These supplementary instructions are issued to allow the successful use of CI+ matting on this common substrate. Because of the large amount of movement encountered on this demanding substrate, it is important that these instructions are followed carefully. 1. All floorboards must be free of flex and vertical movement. 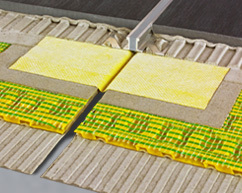 CI+ Matting can absorb horizontal stress, but cannot accept vertical movement. Screw down any loose boards. If a stable surface cannot be achieved, consider overlaying the floorboards with a suitable plywood covering. Because each installation varies it is impossible to give a definite guide but usually a 12mm plus thick board gives sufficient stability for the use of CI+ matting. 2. Check for warping across the board width. This can be a cause of failure in the bond between the underside of the matting and the substrate. Again if severe warping is present overlay the floorboards as above. A self-leveling compound can also be used following the manufacturers instructions as for the need for priming and surface preparation etc. 1. Using an adhesive suitable for fixing onto wooden substrates and following the adhesive manufacturers advice for any priming or surface preparation, apply the adhesive to the surface using a 4mm notched trowel. This should provide a bed of 4mm width x 2mm height ribbed adhesive. Take care to ensure that the adhesive bed is even, without excess in any depressions in the surface. Do not attempt to use the adhesive as a leveling compound. If too much adhesive is present, the result can be that the underside of the matting will become filled with adhesive and the product will not be able to function. 2. Using a flat grouting float press the matting firmly into the adhesive bed. Leaving a gap of approx 5mm at the perimeter between the matting and the wall/skirting. 3. The aim should be to achieve good adhesion to the fixing webbing without filling the cavities in the matting. 1. Follow the basic instructions for CI+ matting. 2. Use a flexible adhesive and grout. 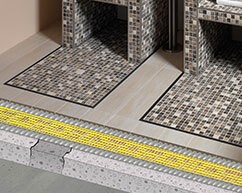 We would advise that tiles below 20mm x 20mm should not be used with CI+ matting. 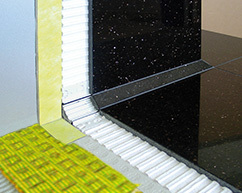 Because of the almost infinite variety of substrate, tile and adhesive / grout combinations it is impossible to provide an absolute guarantee of performance. A reasonable degree of care taken when fitting the product will ensure the best chance of the success enjoyed around the World by users of this product. Note! If using Green or V313 Chipboard you need to contact the adhesive manufacturer and check if there are any special instructions for using adhesive on this type of chipboard.